Book Review Stranger By Olivia Arthur Reviewed by Adam Bell From a distance, Dubai seems to be an oxymoron — a city of opulent wealth surrounded by barren desert. Built and sustained by oil, it is a playground for the rich and an economic prison for the thousands of migrant workers who build and maintain its gleaming façade. Travelling from China and South Asia, they come to the city seeking a better life for themselves and their families, but often end up working for low wages in stifling heat, and live in work camps far from the luxurious city center. 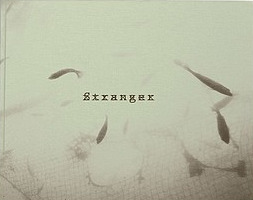 Stranger. Photographs by Olivia Arthur. Fishbar Books, London, UK, 2015. 224 pp., 7¾x10¼x6". From a distance, Dubai seems to be an oxymoron — a city of opulent wealth surrounded by barren desert. Built and sustained by oil, it is a playground for the rich and an economic prison for the thousands of migrant workers who build and maintain its gleaming façade. Travelling from China and South Asia, they come to the city seeking a better life for themselves and their families, but often end up working for low wages in stifling heat, and live in work camps far from the luxurious city center. In 1961, tragedy struck a group of migrants travelling to the city from Pakistan and India. Their boat sank off the coast and 238 people drown. This tragic event forms the heart and narrative thread of Olivia Arthur’s new book Stranger, which imagines a survivor returning to the city roughly fifty-years later. Combining her own images with archival pictures and text, Stranger explores the complex present through the lingering tragedy of the past. Avoiding the obvious ironies of the city, while also navigating the challenges of representing the unknowable other, Arthur offers an imaginative entry into the complexities of Dubai that is compelling and emotionally nuanced. Stranger. Photographs by Olivia Arthur. Fishbar Books, 2015. Oil was discovered in the territorial waters off Dubai in 1966. Its discovery helped fuel the rapid expansion of the city, eventually growing its population to nearly 2.5 million today. Sustained by oil, tourism, and cheap, near slave labor, Dubai seems to epitomize hedonistic excess. Luxurious buildings soar upward from the sand and elegantly dressed men and woman preen about. Expensive cars drive through the empty desert and indoor ski slopes offer escape from the interminable heat for the wealthy few. Arthur does not avoid the obvious subjects of Dubai, but never succumbs to ironic or simplistic condemnations. Along with more expected imagery, we also see more tangential views like clapboarded construction sites, solitary figures strolling across paved sidewalks or standing isolated and surrounded by desert or water, and men crouching for shade in empty parking garages. Perhaps most notably, all the images are printed on a semi-transparent paper allowing the photographs to bleed into each other, overlap, and slowly dissolve. While the use of transparent paper might seem like a gimmick, it works to great effect in Arthur’s book and enhances the content and emotional impact of the work. Like the underwater images of the shipwreck that bookend and recur throughout the book, all the images feel submerged, slightly out of reach, as if they’re slipping away or hovering on the horizon like a mirage. Nothing is stable and the city is as much imagined as it is experienced through a haze of past and present, sand and water, and oppressive heat. The transparent paper also complicates and enriches the sequencing and juxtapositions of the images. Images bleed through those above and are reversed when the pages turn. Slightly disorienting, this produces a surreal, dream-like narrative where the images appear like flashbacks from the titular stranger struggling to reconcile the past with the overwhelming present. Images unfold, overlap and collapse into each other and lose their distinct meaning like memories: a solitary man hovers over the man-made peninsulas of Dubai’s harbor, and a young man resting and buried in the sand is given the wings of a DeLorean car. Dream of escape or flight. In another image, a dark underwater image of nets frames and obscures a young man leaning out a door. Throughout the book, water keeps returning, reminding us of the tragedy so many years ago. Along with the images, snippets of text, drawn from interviews with the workers, hover above or on top of the images. In these excerpts, we read about the men’s struggle for money, their hope for a stable future, and the troubling double bind they face, forced to choose between the need to earn money and the impossibility of advancing in a society that will never accept them. They are free to leave, but have nowhere to go. Even those born there will always be outsiders, forever without a home. As one man notes, “it doesn’t matter that I grew up here. I didn’t have a job so they wouldn’t let me back into the country.” Disenfranchised and disembodied, they form a frequency of unheard voices that echo through the landscape, sink below the surface of the sea and sand, only to rise up again and repeat. Their dissent counters and tempers the opulence that surrounds them.